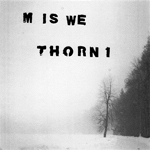 Thorn1 & M is We return to Silber with a split single post punk & post rock showing their darkwave & goth roots. Both tracks mixed by Brian McKenzie (Electric Bird Noise). M is We and Thorn1 deliver late night sounds with the duality of “You Can’t Get Back/Asthma”. Together the two offer up entirely different perspectives. On M is We’s side, they take a more defiant approach to the sound as they burn through the track length with such fervor. By taking on this tact, they start the collection off with a passionate spirit. For the reverse style, Thorn1 choose a more meditative and reflective style. “You Can’t Get Back” starts things on a high note. Riffs are aplenty as the commanding vocals take hold of the track. Everything simply works for the many layers intermingle in a glorious labyrinth of sound. Infinitely catchy, the hooks simply rule over the sound. Vocals are sung with urgency for they have a commanding, dominating presence. Halfway between pleading and demanding, the song is easily the highlight of the collection. Thorn1 take a more tragic take with “Asthma”. Over the course of this piece Thorn1 lets the song build itself up into a stately melody. Vocals extend into the heavens for the entirety of the track takes on a classical bent. At times the pitch darkened elements of the sound feel reminiscent of Interpol’s brooding style. By doing such work Thorn1 lets the track extend and reference a whole lifetime of disappointment. Guitars and piano come together to further emphasize this heightened sense of dread. When placed together, M is We and Thorn1 deliver potent powerful sound.